La Yole holiday camping site is conveniently located a little less than three miles from the town of St Jean-de-Monts, in the Vendee region on the Atlantic coast of France. The site is just a 15-minute walk away from the coastal town's attractive and popular sandy beach. This well planned and maintained holiday resort offers excellent amenities and diverse activities to suit camping families. While personal campers and tents are not permitted onsite, LUX-camp is very happy to advise on your specific luxury accommodation needs. What is special about La Yole luxury camping? Choice of four-star accommodation including luxury mobile home, bungalow tent, luxury tent options. Short distance from a lively, seaside resort. Two-pool complex for adults and kids. 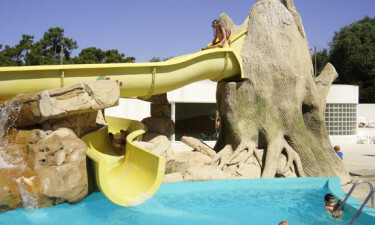 La Yole campsite has an indoor heated swimming pool, complete with water slides and a Jacuzzi. There is a smaller pool to suit toddlers. The friendly staff run a children's club on site, with lots of activities and games to keep kids occupied. Adults will find plenty to do with table tennis, aqua-aerobics, basketball, tennis and bike hire all at your fingertips. There is a gym for keep-fit enthusiasts. Entertainment includes discos, karaoke, live music plus quizzes and games for all the family. If you are keen on water sports, that can be organized too. The site is well known for its helpful and accommodating staff who are very happy to make your holiday unforgettable. St. Jean-de-Monts village is a lively and popular tourist attraction on this renowned Atlantic coastline. The nearby beach nearby is eight kilometres long, with the houses in the quaint town centred on the main church that is aptly named after St. John. Take a ramble around the idyllic streets and soak up the tranquil and relaxed atmosphere. The town is split in two by beautiful pine trees that belong to the Forest Hills country. Plan a picnic or browse the fine array of shopping outlets. Sip a glass of wine in one of the many bars or opt for some local delicacies in one of the restaurants. If you want to venture further out, the Vendee region has many other popular holiday destinations. Most notable are Nantes, Les Sables d’Olonne and Calins Ca-Anes. 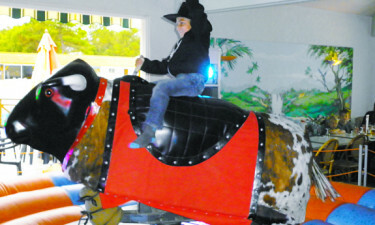 The Indian Forest also provides great adventures with over 60 different activities for young children to choose from. Your camping holiday at La Yole is geared towards family fun with particular emphasis laid on children's activities. The site provides excellent amenity features such as wi-fi, safe deposit boxes, washing machines, hot showers plus a baby bath and room. There is a resident bar, pizzeria and restaurant as well as a take-away service. The site also has a small shop that stocks all your camping necessities, including fresh fruit, vegetables and of course fresh bread, daily.